As an additional safety precaution, replace broken or rotten deck boards before they break through completely. Boards that have become bowed or warped will also need to be replaced because they hold water and make the deck surface uneven, and create another potential safety hazard. If you’re replacing those boards with pressure-treated lumber, maximize the life of your deck by using stainless steel or high-grade galvanized fasteners designed to combat the corrosive effects of modern lumber treatment chemicals. Once everything is secure, clean the deck boards with a biodegradable deck cleaner to remove dirt, mildew and algae. These environmentally friendly solvents are now commonly available and actually perform better than previously popular outdoor wood cleaners such as bleach. Even if your deck is made from a composite material, most manufacturers still recommend a thorough annual cleaning. During the cleaning process, also take a little time to sand down any spots that have become rough or splintered. Finally, ensure your deck looks great by protecting it from mildew and water damage with a high-quality finish and preservative. There are many good products on the market. “The best preservative products contain UV-resistant compounds which will really liven up the deck surface and add a high-degree of protection from the elements,” says Rocchetta. 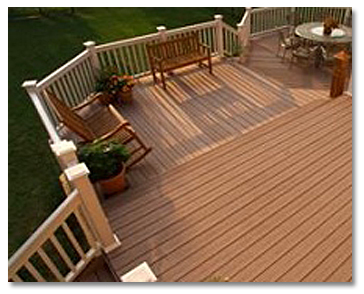 MASTER MAINTENANCE will do you an excellent job cleaning, restoring, resealing your deck. We can put you into a scheduled maintenance program that will assure your pride of ownership for years to come. For many American homeowners, warm weather is an invitation to take the party out to the backyard patio or deck. Before you haul out the grill and light the tiki torches, however, take some time to do a little preventive maintenance. The first step is a thorough inspection of the entire structure to ensure that it is safe and secure. Check for loose nails and screws, and either replace them or retightens them. Tighten any railings that have become loose. Then, look beneath the deck to confirm that beams and support poles remain in good working order. “If you find structural components that are loose, rotten or out of position, for your own safety, quit using the deck and call a pro in to fix the problem,” says Rocchetta.